Measure every pulse at up to 200 kHz with MACH 6. Measure with 12-bit digital accuracy and capture up to 4 million pulses in real time. The Gentec-EO MACH 6 Joulemeter is the only instrument in the world that performs at this speed, and with this precision. It is designed to support the full complement of Gentec-EO fast energy probes that include Silicon, InGaAs and Pyroelectric Detectors. Measure from pJ to mJ and from 0.35 to 2.5 µm. Using the M6-Si detector and the M5-UC-QED accessory, you can make relative measurements at 266 nm. Read more. Gentec-EO's pyroelectric energy meters cover a very wide range, going from nanojoules to several tens of joules per pulse. They also come in various sizes, from 8 mm to 95 mm in diameter and most of them are available with an optional attenuator. For a list of all available models, please read further below. Gentec-EO photo detectors are offered for both power or energy measurements. Measure as low as a few femtojoules in energy or a few picowatts in power, thanks to our highly sensitive sensors and performant electronics. Full details of available models are listed below. New for 2014! Gentec-EO will be launching Integra, a meterless line of All-in-One detectors that combine a detector and a meter in one convenient product. The small but powerful meter of the INTEGRA Series presents a direct USB connection so you can plug it into your PC. Simply use the PC-Gentec-EO software supplied with your product and be ready to make power or energy measurements within seconds! each detector of the INTEGRA Series offers the same incredible performance as the usual detector and meter combination, from pW to kW and from fJ to J. 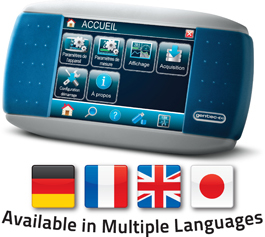 And the good news is that all our most popular products are available with the INTEGRA option. 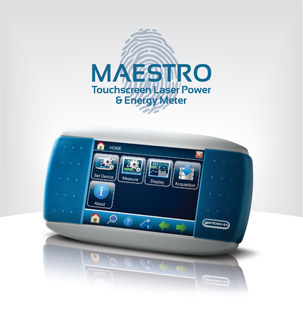 Gentec Electro-Optics have announced the MAESTRO Laser Power & Energy Monitor, their first device with full Touch Screen controls based on a 5.7 inch color LCD screen. The main innovation of this device comes from its ease of use, thanks to an excellent accessibility to all the main functionalities, allowing you to improve your productivity in the lab. Another improvement on the MAESTRO is the data transfer and storage that is now done directly on a USB key. Furthermore, the MAESTRO is also equipped with all the interfaces necessary for an easy and thorough utilization: Ethernet, RS-232, Analog Output, External Trigger and a USB com port for sending serial commands via a PC. Widest range, cw & pulsed, sub-MHz control of up to 8 laser. The HighFinesse/Ångstrom WS8 is the unsurpassed high-end instrument for wavelength measurement of pulsed or continuous laser sources. It delivers unsurpassed absolute and relative accuracy required by cutting-edge scientific research, as well as industrial and medical applications. HighFinesse GmbH is the leading supplier for wavelength measurement devices. The most accurate commercially available wavelength meter in the world is the WS8. This ultra-precise device is capable of measuring pulsed and cw light sources as accurate as 0.8 femtometers! Download detailed pdf brochure here. HighFinesse/Ångstrom offers sensitive and compact wavelength meters with a large spectral range for high speed measurement of lasers. The optical unit consists of temperature-controlled Fizeau-based interferometers that are read out by photodiode arrays. The high absolute accuracy is achieved by use of solid state, non-moving optics. The optical unit and associated electronics are housed in a compact, thermal casing. The connection to a computer or notebook is realized via a highspeed USB 2.0 port, which allows a high data read-out rate. The analyzing software displays all the interferometer information and is compatible with Microsoft Windows.